I love November! It is Native American Heritage Month, and we get to strut our stuff to a national audience as news outlets cover more Native-oriented stories and programs throughout the country put together events to highlight Native American cultures and history. There are also more social media campaigns to show off what contemporary Native people look like (hey, you know stereotypes are still a huge problem for us! ), and We R Native is an exciting new campaign to get Native youth across the nation to show the world what it means to be Native, using the #WeRNative hashtag. 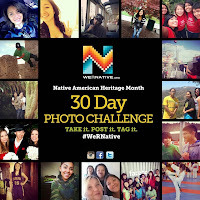 The Oregon-based non-profit, We R Native, is inviting Native American youth throughout the nation to participate in a photo challenge to raise awareness for Native American Heritage. The multimedia health resource for Native teens and young adults is teaming with Native-owned marketing company, Redbridge Inc., to host the #WeRNative Photo Challenge. In the 2010 Census, 5.2 million people reported they were American Indian or Alaska Native (AI/AN), with approximately one-third of these individuals under the age of 18. Native American youth are disproportionally impacted by a variety of adolescent health concerns, including high teen pregnancy rates, drug and alcohol use, and depression and suicide, which heighten their need for programs that align to their unique culture and social context. Anyone who participates will also have the chance to win a We R Native hoodie, shirt, or $75, $50, and $25 prizes. Go to this link to learn more.